About Us | New England Custom Gun Service, Ltd.
New England Custom Gun Service, Ltd. specializes in top quality gunmaking, gunsmithing and firearm restoration services to the sporting arms community, as well as high quality long arms, optics and gun components. Our shotgun line includes AyA shotguns, as well as drillings and combination guns from Germany by such makers as Merkel, and Krieghoff. 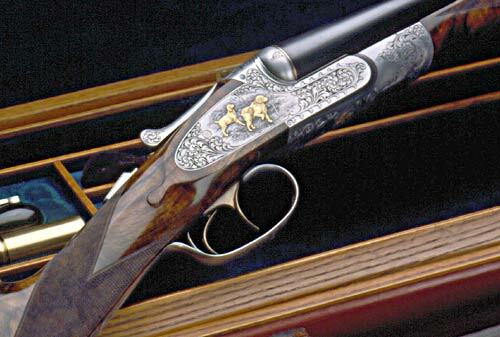 Big bore guns, such as double rifles from Krieghoff, are available as well as bolt action rifles from these and other makers, including Prechtl, Blaser, Dakota, and Sauer. Although not extensive, our used guns list is definitely worth checking if you are in seach of the occasional gem. We also carry the rifle scopes of Schmidt & Bender, a high quality line of German hunting scopes that includes a complete series of Police Marksman long-range tactical sniper scopes. Both series are available with illuminated reticles. Our extensive gun components and gunsmithing tools list features a large assortment of scope mounts by EAW & Recknagel, quality gun sights and gun accessories, including express sights by Recknagel, as well as our newly developed receiver sights, the NECG Peep Sight for Ruger Rifles, Weaver Bases, Grooved 22 and now the CZ Peep. You'll find a lot of knowledge at NECG. Please browse through all we have to offer. Then let us know how we can be of service!! !